Gosh, how did that happen, it is Tuesday again! This week it was Donna's turn to pick a recipe, and she opted for these fabulous sablés, the Espresse Chocolate Shortbread Cookies. Shortbread, or Sablés, are really one my favourites. And I am pretty satisfied with the result. You can have a look at the recipe at Donna's blog Lifes is too short not to eat dessert first" (cool name, isn't it), or in Dorie's book at p. 125. When I read "coffee" in a recipe I always think "Oh no, I don't like coffee flavour". But funnily, whenever I eat sweets with coffee flavour, especially when it is only a bit of it, and combined with chocolate, I like it quite a lot. Don't ask me why. I just have this image of coffee as not very tasty in my mind, but reality always proofs me wrong. This time it was the same. I was very tempted to try the "Playing around" version with oats, but decided to stick with the original in the very last minute. And I am really, really happy with it. And my colleagues were, too. Im glad you all enjoyed the cookies! I loved this recipe too! 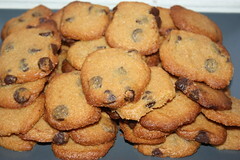 Great cookie, I made the oatmeal version--delish! 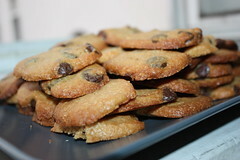 Your cookies like crispy and so yummy! Your shortbread cookies look delicious. I can imagine your co-workers were excited over them =). I'm not a big coffee fan but the rest of my family is. I'll have to make this one for them! I thought your photos were quite nice. I am never happy with mine, either though. Thanks so much for baking with me this week.